Both intersections are located in the downtown area of Swampscott. The problem intersection is Humphrey Street, Burrill Street, and Monument Avenue. Although the Humphrey Street and Redington Street intersection is not problematic, it was included in the analysis because of its close proximity to the problem intersection. The land uses in the vicinity of the two intersections are retail stores, restaurants, residential, recreational, educational, and medical offices. The Swampscott Town Hall, Linscott Park, King’s Beach, Hadley Elementary School, and churches are also located nearby. This is a complex unsignalized intersection under the jurisdiction of the Town of Swampscott. Humphrey Street (Route 129) is a major roadway connecting Swampscott to Marblehead to the north and Lynn to the south. It is classified as an urban principal arterial and carries about 20,000 vehicles per weekday. During each of the peak hours (AM and PM), it carries about 1,000 vehicles in the peak travel direction. Burrill Street is classified as an urban collector and runs generally in the east-west direction, providing a direct connection to the Swampscott’s MBTA commuter rail station. Monument Avenue runs in the north-south direction and it connects to many residential streets north of the intersection. Monument Avenue is a boulevard-type street, with one-way traffic on each side of a green-space median. Monument Avenue is the primary entry into the Olmsted National Historic District. Humphrey Street, Burrill Street, and Monument Avenue are all two-lane, two-way streets with speed limits posted as 25 miles per hour. All three streets are owned and maintained by the Town of Swampscott. Traffic on Humphrey Street is not controlled, but traffic on Burrill Street and Monument Avenue is controlled by stop signs. All three streets have sidewalks on both sides in the vicinity of the intersection, and they are in good condition. On-street parking is allowed in the vicinity of the intersection on Humphrey Street and Burrill Street, but not on Monument Avenue. Marked or painted crosswalks are installed at the intersection, many of which are visible but a couple of which are fading. Wheelchair ramps and curb cuts for connecting the sidewalks to the crosswalks are provided; however, some are not well aligned or even with the road surface. The intersection of Humphrey Street and Redington Street is located approximately 200 feet east of the problem intersection and is under the jurisdiction of the Town of Swampscott. It is controlled by a semi-actuated, demand-responsive traffic signal, which returns the green phase back to Humphrey Street when there is no service request on Redington Street. The signal was installed because of the Hadley Elementary School, which is located at 24 Redington Street, close to the intersection. There are sidewalks on both sides of Humphrey Street and Redington Street in the vicinity of the intersection, and they are in good condition. The crosswalks at the intersection are well marked and visible. There are wheelchair ramps connecting the sidewalks to the crosswalks, but they are not well aligned and leveled. 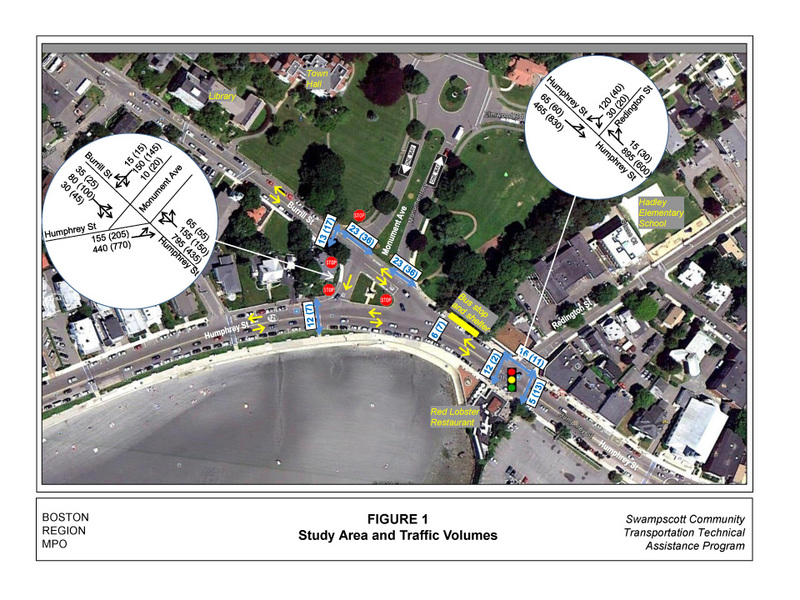 Staff met with the Swampscott town planner and the public works director to discuss the traffic and safety concerns, which are shown in Figure 2. The primary concern is poor traffic circulation at the problem intersection due to the alignment and configuration of the intersecting streets. High-volume traffic during rush hour on Humphrey Street makes it difficult for vehicles attempting to enter Humphrey Street from Burrill Street and Monument Avenue, as well as for eastbound traffic on Humphrey Street attempting to turn left onto Monument Avenue. There are traffic backups on Humphrey Street in both directions during peak hours—a situation which leaves few gaps for traffic on the side streets to enter Humphrey Street and, as a result, forces motorists on Monument Avenue and Burrill Street to make unsafe maneuvers. Motorists were often observed looking confused, making illegal turns, or going the wrong way due to the present intersection configuration, which also creates many conflict points. In addition, the intersection is not pedestrian friendly because of conflicts between pedestrians and vehicles, wheelchair ramps that are not properly aligned or even with road surface, and a lack of curb cuts at some locations. 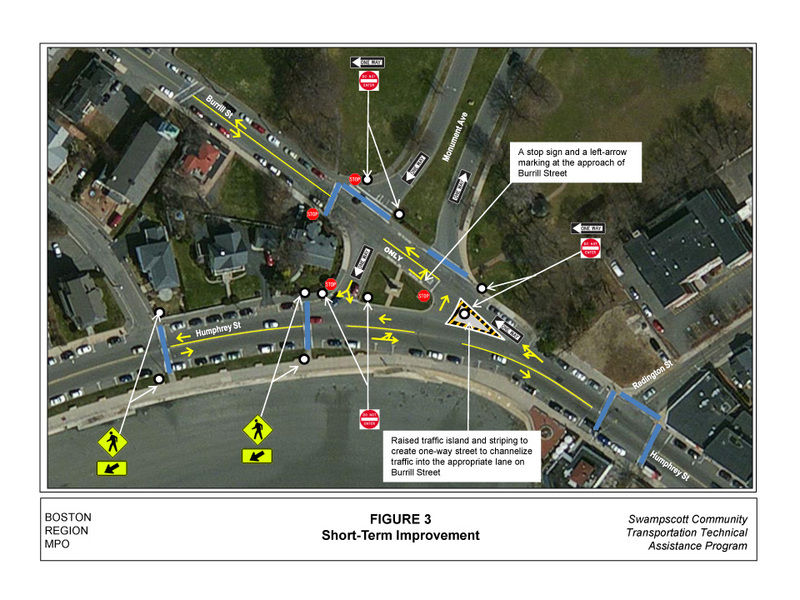 The Town of Swampscott is looking for short-term solutions such restriping, new signs, and changes to the existing traffic circulation pattern, as well as long-term improvements, to alleviate the problems. Staff analyzed crash data from the Massachusetts Department of Transportation (MassDOT) Registry of Motor Vehicles Division for the most recent four years available (2006–09). Tables 1 and 2 present the characteristics of the crashes at the two intersections that were studied. At the problem intersection, there were 24 crashes during the four-year period. They resulted in five injury crashes and 14 property-damage-only crashes; the crash severity of five of the crashes was not known. Angle collisions were the predominant crash type. Two of the crashes involved pedestrians. Four of the crashes occurred during peak periods. Using the PM-peak-hour traffic volumes at the intersection, the crash rate was calculated as 0.77 crashes per million entering vehicles (MEV), which exceeds the Highway Division’s District 4 average crash rate of 0.59 MEV for unsignalized intersections. The high number of crashes and high crash rate indicate that the problem intersection indeed has a safety problem. At the Humphrey Street and Redington Street intersection, there were 16 crashes during the same period. They resulted in six injury crashes and nine property-damage-only crashes; the crash severity of one of the crashes was not known. Rear-end collisions were the predominant crash type. Two of the crashes involved bicyclists and one a pedestrian. Five of the crashes occurred during peak periods. Using the PM-peak-hour traffic volumes at the intersection, the crash rate was calculated as 0.52 crashes per million entering vehicles (MEV), which is less than the Highway Division’s District 4 average crash rate of 0.78 MEV for signalized intersections. Overall, there were three crashes that involved pedestrians and two that involved bicyclists during the four-year period. There are no pedestrian and bicycle crash rates developed for comparing crashes at intersections, therefore MPO staff could not determine based on the number of pedestrian and bicycle crashes and traffic volumes if this intersection is problematic or not. MPO staff collected turning-movement counts at the study intersections on March 20-21, 2012. The data were recorded in 15-minute intervals for the peak periods: 7:00–9:00 AM and 4:00–6:00 PM. The peak-hour turning-movement volumes and pedestrian crossings are shown in Figure 1. About 1,600 vehicles travel on Humphrey Street during each peak hour (AM and PM), with 1,000 vehicles in the peak travel direction (westbound in the AM and eastbound in the PM). Around 80 percent of the traffic on Humphrey Street continues through the study intersections, while the remaining 20 percent turns onto Monument Avenue, Burrill Street, or Redington Street. The majority of the traffic on side streets also heads to Humphrey Street. There was moderate pedestrian activity at the two intersections, and school crossing guards assist pedestrians in crossing the street at these intersections. There were nine bicyclists and 126 pedestrians who entered the problem intersection during the four-hour counting period (two hours in the morning and two in the afternoon). At the Humphrey Street and Redington Street intersection, five bicyclists and 66 pedestrians entered the intersection during the same period. 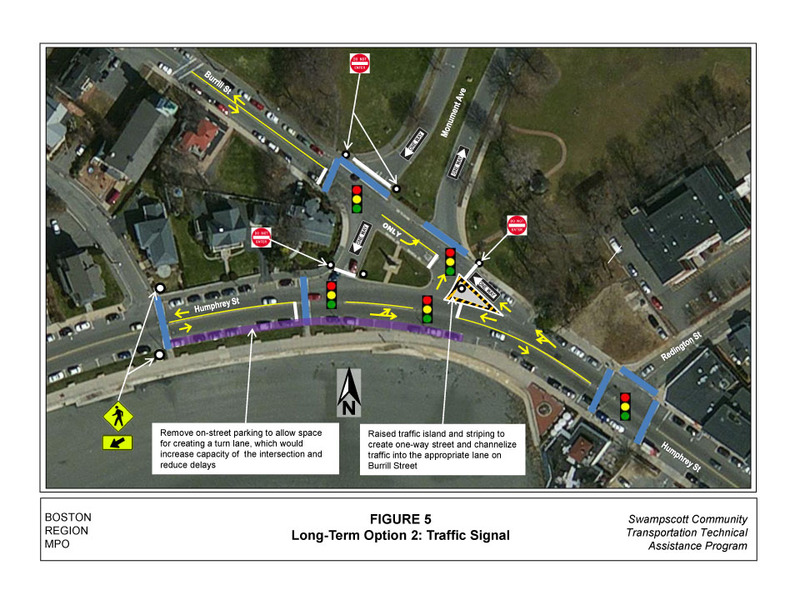 Based on the turning-movement counts, lane configurations, and signal timing and phasing information (obtained from the MassDOT Highway Division), intersection capacity analyses were conducted by using an intersection capacity analysis program, Synchro. 1 The performance of an intersection is calculated using the methodology defined in the 2010 Highway Capacity Manual.2 The key performance measures, which are obtained through analysis, are levels of service (LOS), vehicle delay, and queue length. LOS is the term used to describe the quality of traffic flow on a roadway facility at a particular time. Operating levels of service are reported on a scale of A to F, with LOS A representing free-flow or uncongested conditions with little delay to motorists, and LOS F representing congested conditions with long delays and traffic demands exceeding roadway or intersection capacity. Table 3 shows the operating LOS for the intersections, which is a function of vehicle delay. Tables 4 and 5 shows the AM and PM peak-hour analyses, respectively, for the existing conditions. The analysis indicates that traffic on Burrill Street and Monument Avenue experiences unacceptable delay and queuing when passing through the intersection during peak periods. As a short-term measure to address the problems that was examined by MPO staff is the possibility of modifying the existing intersection configuration, traffic circulation, and signage at the problem intersection to reduce the number of conflicts and improve sight lines and safety. Figure 3 shows the short-term improvements, which target the traffic on Burrill Street and Monument Avenue that is proceeding to Humphrey Street eastbound. These drivers would have to twist their necks in order to see vehicles on Humphrey Street heading eastbound and yield to them because of the alignment of Burrill Street at Humphrey Street. Analysis indicates that this short-term option would increase delay for traffic on both Burrill Street and Monument Avenue during peak periods, as the majority of the traffic on both streets would be routed to the short opening south of both streets (Tables 4 and 5). With the short-term improvements, traffic on Burrill Street and Monument Avenue would still operate at an unacceptable level of service, “F.” In addition, because of its length, the opening would not be able to store more than three vehicles and could result in a traffic queue blocking the intersection. The short-term improvement calls for installing “do not block intersection” signs at Burrill Street and Monument Avenue approaches. This would allow the intersection to operate effectively by allowing westbound traffic on Humphrey Street heading to Burrill Street and Monument Avenue to flow smoothly. In addition, the short-term option would require relocation of the inbound MBTA bus stop and shelter about 40 feet (two parking spaces) further east, toward Redington Street, due to the proposed traffic island and one-way street. Relocation of the MBTA bus stop should not result in any loss of parking, because the space created as a result of moving the MBTA bus stop could be converted back into parking spaces as a replacement. On the other hand, the short-term improvements would provide a much safer intersection, as traffic would be streamlined through the intersection and the sight line for Burrill Street and Monument Avenue traffic entering Humphrey Street would be much improved. The short-term modifications are a low-cost solution and would cost approximately $10,000 to construct. Because of the modest benefits from the short-term improvements, MPO staff developed two long-term improvements to address traffic concerns at the problem intersection. The long-term improvements would provide the most benefits for improving safety and alleviating traffic delay and queuing at the problem intersection, but they are expensive and would need community approval. The options consist of replacing the existing intersection with a modern roundabout or a traffic signal. Two alternatives were evaluated in the roundabout option: a single-lane roundabout with no slip lanes, and a single-lane roundabout with an eastbound slip lane on Humphrey Street. Analysis indicates that a roundabout option would reduce delay on the side streets but increase delay for traffic on Humphrey Street during the AM and PM peak periods (Tables 4 and 5). The increase in delay results from the fact that traffic on Humphrey Street at present is free-flowing, or uncontrolled. With a roundabout, traffic on Humphrey Street would be interrupted by traffic on Monument Avenue and Burrill Street. During the AM and PM peak periods, analysis shows that traffic in the peak direction of travel on Humphrey Street (westbound during the AM peak period and eastbound during the PM peak period) would operate at unacceptable levels of service (LOS F). Tables 4 and 5 show the results of the intersection capacity analysis. The high volume of entering and conflicting (circulating) traffic at the Humphrey Street approaches during the peak periods is the primary reason for the failures. Guidelines in the National Cooperative Highway and Research Program (NCHRP) Report 6724 suggest that when the volume threshold for the sum of the entering and conflicting volumes at an approach is in the range of 1,000 to 1,300 vehicles per hour, a two-lane entry may have to be considered, and evaluated, for that approach. For the proposed single-lane roundabout, the sum of the entering and conflicting peak-period traffic volumes at the Humphrey Street approaches is in the range of 1,150–1,200 vehicles per hour. These volumes call for slip lanes or double entry lanes on Humphrey Street. Because the Humphrey Street approaches were failing during the peak-hour, the operations of the single-lane roundabout were enhanced by adding a right-turn slip lane on the eastbound approach of Humphrey Street. The slip lane treats straight-through traffic eastbound on Humphrey Street as free right-turns, and allows the roundabout to operate satisfactorily during the AM and PM peak periods (Tables 4 and 5). The shortcoming of the slip-lane alternative is that it would take away about 12 on-street parking spaces. In addition, if this location is reconstructed as a roundabout, the traffic signal at the next intersection could be removed. Southbound left turns out of Redington Street would be prohibited. Instead, all southbound traffic would turn right and proceed though the rotary, where the left turns would reverse direction to travel eastbound. One major handicap of the roundabout option is that would be located in an area with National Historic District designation that has guidelines intended to promote responsible preservation practices that help protect cultural and historic resources. The roundabout option would need to be sensitive to the area’s historic status and visual and architectural significance and would need to satisfy all applicable state and federal historic preservation laws. It would need to be designed with input from the Massachusetts Historical Commission, Swampscott Historical Commission, and Historic District Study Committee to ensure that historic issues are identified. Therefore, MPO staff recommend further review of this option to determine its feasibility. 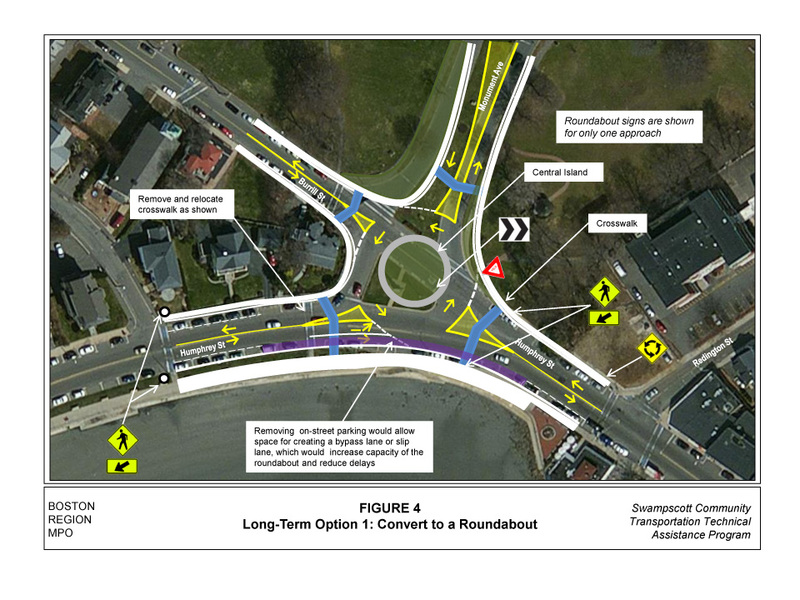 An estimate of the construction cost for each of the proposed roundabout is in the range of $1–1.5 million, and it may require Boston Region MPO programming and funding. Option 2 would convert the existing unsignalized intersection into a traffic signalized intersection whose signal would be coordinated it with the signal at Humphrey Street and Redington Street. Presently this intersection meets traffic signal Warrant 2 (Four-Hour Volume) and Warrant 3 (Peak-Hour) of the Manual on Uniform Traffic Control Devices (MUTCD).5 Option 2 would result in two closely spaced traffic signals on Humphrey Street. The objectives of installing a traffic signal would be to be able to preserve the triangular island and its monument in the center of the intersection and to maintain the existing traffic circulation and on-street parking, while providing positive green times for each approach at the intersection to move its traffic safely and reduce conflicts. Analysis indicates that this alternative would increase delay at the intersection during the AM and PM peak periods (Tables 4 and 5). The increase in delay results from the split signal phases required for safe operations due to the geometry of the intersection and the absence of turn lanes. Analysis indicates that during peak hours, traffic would operate at unacceptable levels of service (E or F) at all approaches to the intersection. This alternative was evaluated to determine if adding a turn lane would significantly increase capacity and reduce delays at the intersection. Analysis indicates that the alternative with a turn lane on the Humphrey Street eastbound approach would improve traffic operations at the intersection. The only approach that would fail is Humphrey Street westbound during the AM peak period, due to the high volume of traffic in the peak direction of travel. As in the roundabout alternative with a slip lane, about 12 parking spaces would be taken on the eastbound approach of Humphrey Street to achieve this improvement. An estimate of the construction cost for each of the traffic signal alternative is estimated to be approximately $1 million, and it may require Boston Region MPO programming and funding. Based on the evaluation of the existing conditions and problems, it has been determined that interrupting traffic on Humphrey Street would result in reduced delays and queues in the intersection. The short-term option would not reduce delays and queues at the intersection, because the improvements would not interrupt traffic on Humphrey Street. The long-term options would reduce delays for traffic on Monument Avenue and Burrill Street and improve capacity of the intersection in some ways. The common factor in all the long-term options is interrupting traffic on Humphrey Street to allow the traffic on Monument Avenue and Burrill Street to access Humphrey Street. 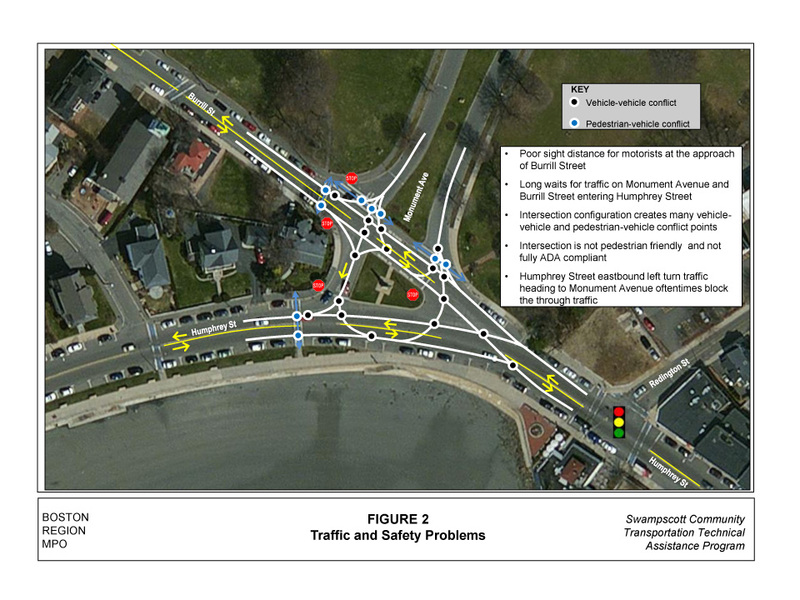 Option 1, the construction of a roundabout, would reduce delay at the problem intersection by, changing the existing traffic circulation pattern and interrupting traffic on Humphrey Street to allow traffic on the side streets to more easily enter the intersection. The roundabout alternatives would require converting the triangular island at the problem intersection into a central island and relocating the monument. The roundabout alternative with a slip lane on the eastbound approach of Humphrey Street would perform better, but it would take away on-street parking spaces. The roundabout option is also pedestrian friendly, as pedestrians would have the opportunity to cross at all approaches, would have shorter crosswalks, would have refuge areas for waiting to cross when it is safe, and would need to check for only one direction of traffic flow at a time. Two major issues with the roundabout option are that it would alter the traffic circulation pattern and it would also alter the appearance of an intersection that is located in a National Historic District. Staff suggest an additional review of this option to determine if it is feasible. Option 2, the installation of a traffic signal, would not change the existing traffic circulation pattern or necessitate the conversion of the triangular island to a roundabout, but would create two closely spaced signals (about 200 feet apart) that might contribute to queuing. The traffic signal alternative with a turn lane on the eastbound approach of Humphrey Street would perform better but would also remove on-street parking spaces. Capacity Manual, Fifth Edition, Washington, DC, 2010. 3 In this document, the word “roundabout” refers to modern roundabouts, which have a smaller central island and a tighter deflection angle than older designs to slow down vehicles entering the roundabout and vehicles in the circulatory lane(s) to speeds between 20 and 25 mph. 5 U.S. Department of Transportation, Federal Highway Administration, Manual on Uniform Traffic Control Devices for State Streets and Highways, 2009 Edition. * Peak periods are defined as 7:00–10:00 AM and 3:30–6:30 PM. 2 95th percentile queue length in feet.